After all the thunder and lightning, I'm not surprised that Rack is skittish. I should say, I'm not surprised he's more skittish than normal. I shouldn't be introducing new things at this time of year. He's not as Bulletproof with that sort of thing as my Lettie was. He's a highly fearful McNab Dog. Regaining some confidence is coming slowly and it is something I am actively trying to foster. But there are times that I really have to wonder. We had had major thunderstorms every day last week. Then Saturday came. Then hoards of people descended upon Wilton Manors. Yes, we had the Stonewall Pride Wilton Manors street festival. You know the maxim about parties, right? If you are going to hold a party, invite your neighbor. Preferably have a lot of goodies to eat and drink, and send them home happy, that way they can't complain? I can't complain. My home is so close to the party that in my back bedroom I was listening to Sheila E perform live when she was on stage at the end of the live music program. Try to charge me cover to get into see that and that would be where I would have a problem with it. So I went out to help. I was out at the booth for my board helping to sell bricks for a while. Wilton Manors Development Alliance is trying to build a plaza with the City of Wilton Manors' help and approval on park land in the heart of Wilton Manors so that everyone can enjoy it now and for a very long time in the future. It will be a centerpiece in the middle of the central business district of the city when done. The Children's Art Project now has a replica of the post card that originally advertised the land by the original development of the city of Wilton Manors. There's a small plaza that we're dutifully filling in with laser engraved bricks with sayings. The profits are actively going to build and furnish the plaza. There is art there that has been created by and for the children of Wilton Manors. Their work will help improve the life of the city for decades. I sat outside and noticed that while it was hot, there was a storm starting to brew. 10 minutes later we were gathering up our artwork and trying to hide it from the monsoon that flew up. All the while, the music never stopped. When our replacements arrived, we went for lunch. The rains stopped and restarted. The party went on with light rains here and there that surged with the beat. We got home and Rack came out of his crate wondering what had unleashed these loud demons that were stomping all over our neighborhood. By the time that the parade started at 7PM, the rains had stopped. The music throbbed on. We came back in time to walk Rack, and he was even more disturbed than he was in the afternoon when we returned. Poor little guy had just had enough of this commotion. Luckily there won't be any more street festivals for a couple months. It's just too hot in Florida in Summer for that sort of thing, although it's hotter in Philadelphia from now through a normal September than it is here. Normal. This is El Nino so we are watching things closely. It's supposed to stop the hurricanes for a bit but give us more rain. Rack won't like that. More Rain. More Thunder. More Hiding. When I got him back from the last walk of the night, Sheila E was singing her heart out. I was enjoying her act from my bedroom where the volume was "comfortable", but I'm sure Rack would have loved the earplugs that I keep in the headboard. He eventually had his dinner that I had put out five hours earlier and we both went to sleep. The next morning, Sunday, I was up at Stupid o'clock again. Rack was sleeping against the bed instead of being another six feet across the bedroom in his own bed. Residual effect from everyone else's party. We went out. He stepped out onto the front porch quickly but sniffed the air with caution. There wasn't a cloud in the skies at 5AM, cool too. All that rain washed the skies clear. We started to walk towards The Drive. Rack did not want to go at all! The cleaning crew was still finishing up on Wilton Drive. They had been out overnight. festival. You can tell that the economy is getting better in China. The giveaways are better. Aluminum party whistles emblazoned with company names and websites. Scattered mardi gras beads everywhere. Aluminum Drinking Straws wrapped individually in plastic. Wait, what? 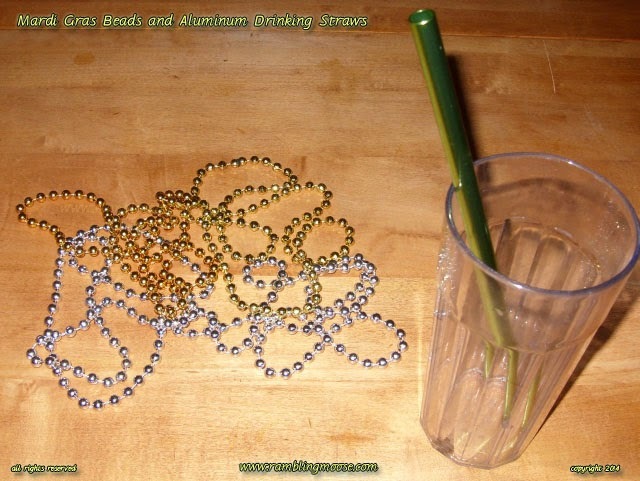 Aluminum Drinking Straws. With company logo? Have we as a species finally lost our collective minds? I realized what I was holding when I scooped it up from where I found it sitting on a bench. Perfectly wrapped in plastic about two grades thicker than it needed to be. That will go to the trash-to-steam plant on Tuesday. Laughing at this green aluminum cylinder, I headed Rack back to the house with my find in hand. Between the aluminum party whistle and the big industrial strength straw, there was just a lot of recyclable materials that were being used in new and creative ways. We trotted back to the house. No storms, no dogs, no problems. After all it was over an hour before sunrise. Waiting for the water to boil, I spotted the Mardi Gras beads sitting on the counter. Remembering that Lettie thought that those beads were hers as a fashion accessory, and that I have a 2 liter glass beer stein sitting on the windowsill filled with the things as a result, it was time to see what Rack thought. I didn't see Rack for another hour. I held the beads out for Rack to sniff. It's new. He was fine. For now. I guess introducing my dog to tacky plastic silver beads wasn't going well. Calling Rack didn't work. As he got to the corner to turn into the bedroom, Rack shot me a look back over his shoulder as if to say "Get Real, I'm Not Going Near That". I'm used to him hiding, and we didn't need him to wear beads. This is not New Orleans, this is Florida. I can always re-home the extra beads. After all, there's a plastic tree hiding in a box in the shed that they will look nice on come the holidays.